Today in 1983, the motion picture Vacation was released in theaters. In the film, Clark Griswold tried to create the perfect family trip. Traveling cross-country to the fictional Walley World, he and his family hit the road to see the nation in a Wagon Queen Family Truckster car. The motion picture went on to become a classic and the car became an iconic part of the film. Fast-forward to 2013, and a real-life family of Griswolds, Steve and Lisa Griswold, and their two daughters, Amber and Brooke hopped into a custom-made Wagon Queen Family Truckster and drove from their home in Canton, Georgia, to Walt Disney World Resort. The custom car is only about 2 weeks old and this is the first vacation the family has taken in it. What was formerly a brown station wagon was transformed by a car shop in Georgia with new wood-panel siding and a new “metallic pea” color (the exact hue described in the film) paint job. Steve then added special touches like custom-made gold crown symbols on the side of the car, the signature, silver crown hood ornament and even a (faux) fuel tank door on the hood. (Be sure to take a look at the photo gallery to see more.) He also added a few modern conveniences, including DVD players (which were loaded with the Vacation film when we visited) and Bluetooth wireless technology. After putting some vintage luggage that he purchased online atop the luggage rack, the Griswolds were ready to hit the holiday road to Walt Disney World Resort. One of their stops? Disney’s Art of Animation Resort, a natural fit since much of the new resort is dedicated to an entire town of famous Cars. 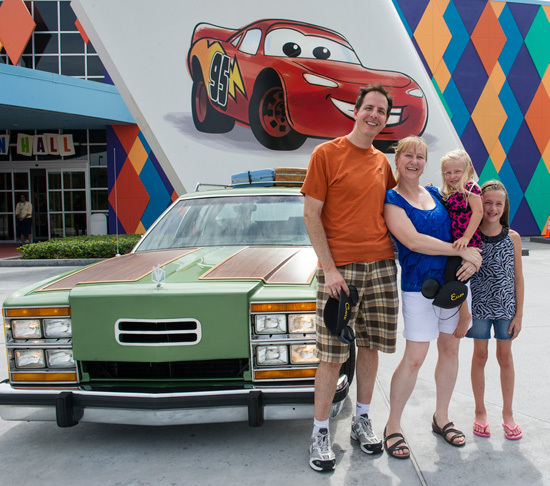 The Family Truckster, Lisa says, is another fun way to experience Walt Disney World Resort. For years people have commented about our name being Griswold and our love of Disney, she said. We wanted to have fun with it and experience it on a wonderful family vacation. As Disney Parks Blog author and Yellow Shoes Creative Group photographer Gene Duncan took these photos and our Global Content Development broadcast crew shot the video, a crowd began gathering in front of Disney™s Art of Animation Resort to admire and take photos of the car. We’ve had such a wonderful time. Lisa says. We valeted the car at the Grand Floridian the other night before we ate dinner there, and the cast member couldn’t believe it. He told us he’s parked about every type of car there is, but never a family truckster.